Definition at line 22 of file HexagonHazardRecognizer.h. Definition at line 44 of file HexagonHazardRecognizer.h. Definition at line 49 of file HexagonHazardRecognizer.h. References AdvanceCycle(), EmitInstruction(), getHazardType(), Reset(), and ShouldPreferAnother(). This callback is invoked whenever the next top-down instruction to be scheduled cannot issue in the current cycle, either because of latency or resource conflicts. Definition at line 77 of file HexagonHazardRecognizer.cpp. References llvm::SmallSet< T, N, C >::clear(), llvm::DFAPacketizer::clearResources(), llvm::dbgs(), and LLVM_DEBUG. This callback is invoked when an instruction is emitted to be scheduled, to advance the hazard state. Definition at line 108 of file HexagonHazardRecognizer.cpp. References assert(), llvm::DFAPacketizer::canReserveResources(), llvm::dbgs(), llvm::MachineInstr::getDebugLoc(), llvm::HexagonInstrInfo::getDotNewOp(), llvm::SUnit::getInstr(), llvm::MachineInstr::getOpcode(), llvm::MachineBasicBlock::getParent(), llvm::MachineInstr::getParent(), llvm::SmallSet< T, N, C >::insert(), llvm::HexagonInstrInfo::isHVXVec(), LLVM_DEBUG, llvm::HexagonInstrInfo::mayBeCurLoad(), llvm::HexagonInstrInfo::mayBeNewStore(), llvm::MachineInstr::mayLoad(), llvm::MachineInstr::mayStore(), MI, llvm::MachineInstr::operands(), llvm::DFAPacketizer::reserveResources(), and llvm::SUnit::Succs. Definition at line 39 of file HexagonHazardRecognizer.cpp. References llvm::DFAPacketizer::canReserveResources(), llvm::SmallSet< T, N, C >::count(), llvm::MachineFunction::CreateMachineInstr(), llvm::dbgs(), llvm::MachineFunction::DeleteMachineInstr(), llvm::MachineInstr::getDebugLoc(), llvm::HexagonInstrInfo::getDotNewOp(), llvm::SUnit::getInstr(), llvm::MachineInstr::getNumOperands(), llvm::MachineInstr::getOpcode(), llvm::MachineInstr::getOperand(), llvm::MachineBasicBlock::getParent(), llvm::MachineInstr::getParent(), llvm::MachineOperand::getReg(), llvm::ScheduleHazardRecognizer::Hazard, llvm::MachineOperand::isReg(), LLVM_DEBUG, llvm::HexagonInstrInfo::mayBeNewStore(), MI, and llvm::ScheduleHazardRecognizer::NoHazard. The hazard state is set to an initialized state. Definition at line 27 of file HexagonHazardRecognizer.cpp. Handle the cases when we prefer one instruction over another. Case 1 - we prefer not to generate multiple loads in the packet to avoid a potential bank conflict. Case 2 - if a packet contains a dot cur instruction, then we prefer the instruction that can use the dot cur result. However, if the use is not scheduled in the same packet, then prefer other instructions in the subsequent packet. Case 3 - we prefer a vector store that can be converted to a .new store. The packetizer will not generate the .new store if the store doesn't have resources to fit in the packet (but the .new store may have resources). We attempt to schedule the store as soon as possible to help packetize the two instructions together. 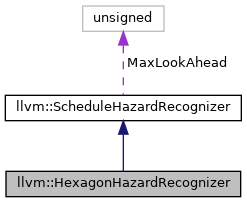 Definition at line 100 of file HexagonHazardRecognizer.cpp. References llvm::SUnit::getInstr(), llvm::SUnit::isInstr(), and llvm::MachineInstr::mayLoad().